During the eighteenth and nineteenth centuries, a great deal of research was directed toward discovering the link between electricity and magnetism. A Danish physicist, Hans Christian Oersted, discovered that a magnetic field existed around a conductor carrying an electric current. You can perform an experiment that shows the magnetic field around the current carrying conductor. 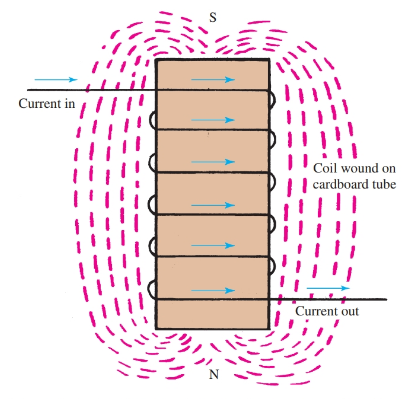 Pass a current carrying conductor through a sheet of cardboard. Place small compasses close to the conductor. The compasses will point in the direction of the magnetic lines of force, Figure 1. Reversing the electric current will also reverse the direction of the compasses by 180 degrees. This shows that the direction of the magnetic field depends upon the direction of the current. Figure 1. Compasses line up to show circular pattern of magnetic field around current carrying conductor. 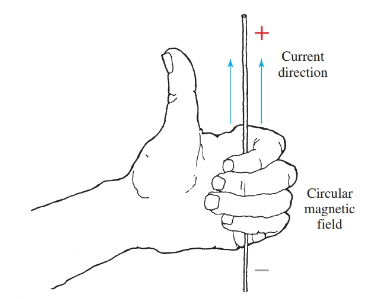 The left-hand rule for conductors can be used to determine the direction of the magnetic field around a current-carrying conductor. Grasp the conductor with your left hand, extending your thumb in the direction of the current. 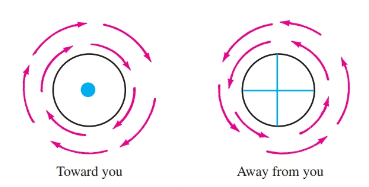 Your fingers curling around the conductor indicate the circular direction of magnetic field, Figure 2. Figure 2. Demonstration of the left-hand rule for conductors. In Figure 3, picture the dot in the center of the conductor on the left as the point of an arrow. This shows that electric current is flowing toward you. Circular arrows show the direction of the magnetic field. This principle is very important when electrical wires carry alternating currents. This is because the placement of wires, or lead dress, has an influence on the workings of a circuit. Conductors are grouped in pairs whenever possible to eliminate heating effects and radio interference caused by the magnetic field created by the electric current flow. The National Electric Code requires that wires be run in pairs to help eliminate this heating effect. Figure 3. These conventions are used to show the link between electric current flow and the magnetic field. The dot represents a current arrow heading toward you. The cross on the right represents the tail end of the current arrow heading away from you. Here, you will be introduced to the terms used to describe quantities and characteristics of magnetic circuits. It has already been mentioned that a likeness exists between magnetic circuits and electrical circuits. In addition, a law for magnetic circuits exists that is comparable to Ohm’s law for electrical circuits. This law is known as Rowland’s law. Rowland’s law states that the number of lines of magnetic flux (comparable to current in electrical circuits) is in direct proportion to the force (comparable to voltage in electrical circuits) producing them. This force (F) is in units of magnetomotive force called gilberts. Where ϕ = force producing the field, ℛ = resistance to the magnetic flux (reluctance). Where F is the force in gilberts, I is the electric current, and N is the number of turns. The term reluctance has been defined as the unit of measurement of the resistance to the passage of magnetic lines of force. Experimentation proves that, as the flux path increases in length, the reluctance increases. Likewise, as the cross-sectional area of the flux path decreases, the reluctance increases. Reluctance also depends upon the material used as the path. The ability of a material or substance to conduct magnetic lines of force is called permeability. The permeability of air is considered to be one. Materials with permeabilities higher than one conduct the lines of force better than air. Materials with permeabilities lower than one offer more resistance to magnetic lines of force. Where ℛ is the reluctance, l is length of path, μ is the permeability of the material in the path, and A is the cross-sectional area of the path. The term l is, again, the length of path expressed in centimeters. When making calculations the B, H, and μ of common magnetic materials can be found in an electricity handbook. When a current carrying conductor is wound into a coil, or solenoid, the magnetic fields circling the conductors seem to merge or join together. A solenoid will appear as a magnetic field with a N pole at one end, and a S pole at the opposite end. This solenoid is shown in Figure 4. Figure 4. A wire wound into a coil is a solenoid and has a polarity set by the direction of current flow. 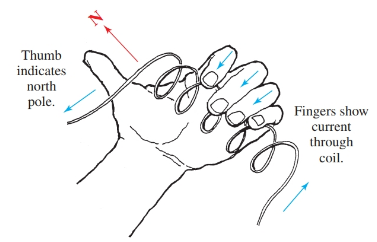 The left-hand rule for coils can be used to determine the polarity of the coil. Grasp the coil with your left hand in such a manner that your fingers circle the coil in the direction of electric current flow. Your extended thumb will point to the N pole of the coil, Figure 5. Figure 5. Demonstration of the left-hand rule for coils. The strength of the magnetic field of a solenoid depends upon the number of turns of wire in the coil and the size of the current in amperes flowing through the coil. The product of the amperes and turns is called the ampere-turns (At or NI) of a coil. This is the unit of measurement of field strength. In the solenoid just discussed, air only is the conductor of the magnetic field. Other substances conduct magnetic lines of force better than air. These materials would be described as having greater permeability. 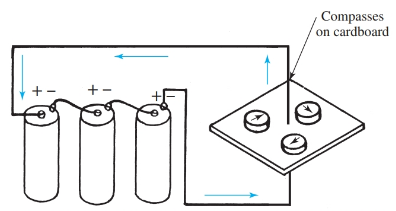 To demonstrate this, a soft iron core can be inserted in the solenoid coil, Figure 6. The strength of the magnetic field is greatly increased. There are two reasons for this increase. First, the magnetic lines have been concentrated into the smaller cross-sectional area of the core. Secondly, the iron provides a far better path (greater permeability) for the magnetic lines. This device (solenoid with an iron core) is known as an electromagnet. Figure 6. The coil with an iron core is described as an electromagnet. When an electromagnet is energized, it is a powerful magnet. When the electrical energy is disconnected, the electromagnet loses most of its magnetism, but not all of it. If the depowered magnet is brought near some iron filings, the filings will be attracted to the core because the iron core has retained a small amount of its magnetism. This magnetism is called residual magnetism. If very little magnetism remains, the core would be considered as having low retentivity. Retentivity is the ability of a material to retain magnetism after the magnetizing field has been removed. If a core retains a good deal of magnetism, it is said to have high retentivity. A soft iron core shows low retentivity. A steel core has high retentivity.